G’day, here we are, Day 5 of the challenge is already upon us. As I have already posted, Dale from imoverthehill.com has graciously accepted the challenge and the baton will change hands after this post. As you may or may not know, Australia is rapidly becoming known as the place of ‘Big Things’. We have the Big Banana, The Big Trout, The Big Orange, The Big Pineapple, the Big Prawn and countless others. Some people love them and naturally, some loathe them. Where I live in country New South Wales, the fortunes of my town once rode on the sheeps back as the saying used to be. And a Merino sheep’s back it certainly was. So it followed, as night follows day that the city fathers smiled at the proposal for us to have something BIG to recognise the value of sheep to us. With our boring you with all of the tedious details, The Big Merino, or RamBo, as many now call it arrived on our town’s doorstep some years ago. In 2013, our town, proudly known as the State’s First Inland City celebrated its 150th birthday. Quite an achievement by Australian standards. To celebrate, the local Knitters Guild took the decision to knit a scarf for Rambo as the weather at the time of the birthday celebrations could be a little chilly. Accordingly, the ladies of the Knitters Guild took to work knitting squares, not in merino wool, horror of horrors, but in acrylic. This decision was taken because of the weight of the finished scarf and the fact it would be exposed to the weather for some months. Many hundreds of colourful 10inch by 10inch squares were knitted and sewn together making a gigantic scarf for Rambo. 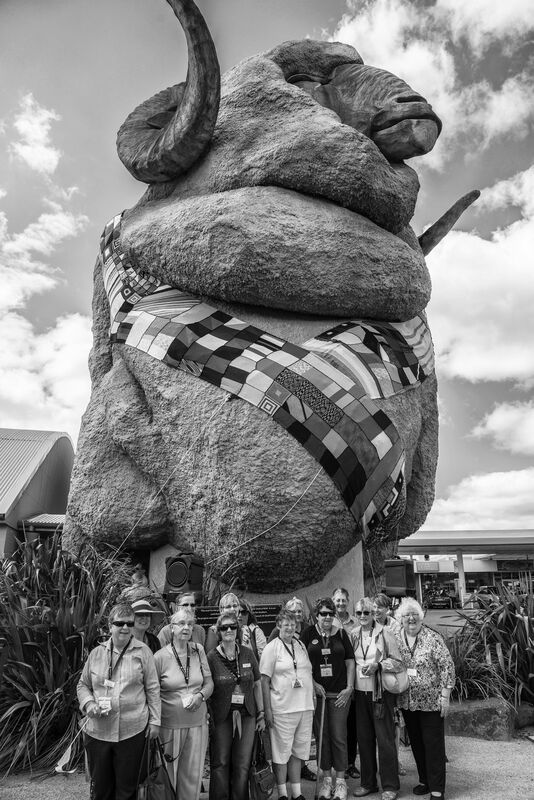 THE BIG MERINO @ RAMBO AND HIS SCARF WITH MEMBERS OF THE GOULBURN BRANCH OF THE KNITTERS GUILD. It took a crew of workers with a cherry picker quite some time to place the scarf around RamBo’s neck. The scarf became quite a tourist attraction and was the subject of TV documentaries and newspaper articles for quite a while. Eventually, when the scarf was taken down, it was divided up, commercially cleaned and donated to various institutions around our city. As my wife observed me preparing ths blog she became quite agitated as the image is in monochrome and doesn’t display the scarf in all of it colourful glory. As a peace preserving action, I’ve promised to place a coloured image on a future blog. For the technically minded, I made the original of this image using my lens set at 24mm, aperture at f5.6, shutter speed at 1/500th second, ISO 100, tripod mounted. The image was converted from colour to monochrome using Nik software’s Silver Efex Pro2. Well, that’s it from me, I’ve enjoyed the 5 day challenge, thanks for looking and I know Dale’s images will be absolute rippers. G’day, here as I developed Day 5 of the challenge, the date is 31/3/15 or 3/31/15 according to your preference. This time difference can become quite confusing. That’s amazing (and pretty funny).